As Anonymous reminded me in the comments below, there was a stainless steel lining to my little cloud of pique. I *did* give the fridge a good scrubbing, and in turn, pulled out several more things from the freezer inventory. I've been meaning to clean it out in preparation for pre-baby frozen dinners, anyway. 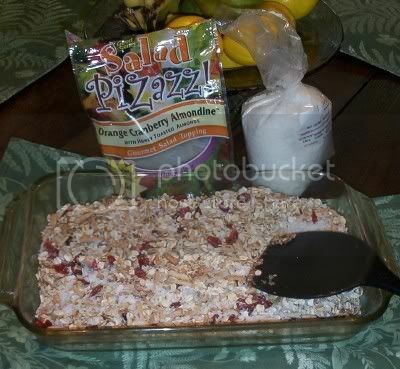 I had stashed several bags of this Salad Pizazz from the salvage store (50 cents each). No one else was as fond of the fruit and nut combination as I was, so it went in a batch of homemade granola instead. Your blog has really inspired me to watch our budget and hunt for bargains, etc, basically to be frugal. And that granola looks so yummy! How do you make granola from scratch? It had never occurred to me to make it from scratch, but once again you have inspired me to try something new! Thanks. Melanie, another blog (Mrs. Happy Housewife) reminded me how inexpensive homemade granola can be. I like to sprinkle it on plain yogurt, but I never put enough butter to get the oats crispy and browned (you know, the good stuff!). Instead mine are only lightly toasted.